Oscar outlook: The best thing about knowing who's been Oscar nominated is that it ends the endless speculation about who's going to be nominated. Unfortunately, announcing the noms starts a new round of endless speculation about who will win when Oscar's sealed envelopes are opened Feb. 28 at the 88th annual Academy Awards. "The Big Short,""Mad Max: Fury Road,""The Revenant"and "Spotlight" are best picture front-runners since they're also nominated for directing and film editing. Those are critically important races to be in because noms in both (but not necessarily wins) have been linked to best picture success for decades. A film editing nod is particularly important because from 1981 through 2014, all of Oscar's best picture winners were also film editing nominees. In 16 of those 33 years, the best film editing winner also took home the best picture Oscar. 2015 was an exception, however, with"Birdman" winning best picture, but not having a film editing nod. The film editing winner turned out to be "Whiplash,"which did have a best picture nom. Many Hollywood handicappers had expected "Boyhood" to beat "Birdman" for best picture. Had that happened, it would have perpetuated the connection between winning best picture and being a film editing nomineesince "Boyhood" had a film editing nom. Just to complicate things even more, "Birdman" did receive a feature film editing nom in the 2015 American Cinema Editors awards, but it's the Oscar branch not the guild that's the benchmark for predicting best picture Oscar success. "Room" has a directing nod, but isn't up for film editing, which puts it at a disadvantage. "Bridge of Spies," "Brooklyn" and "The Martian" aren't up for directing or film editing, giving them less likelihood of winning than the four best picture contenders that also are in the directing and film editing races. The four films with noms for best picture, directing and film editing also share another important advantage – their directors are nominees in the Directors Guild of America (DGA) awards race. Since 1950, only seven DGA winners have missed out on also winning the best directing Oscar. Films with best picture Oscar noms but no directing branch noms are referred to by awards marketers as "orphans" and have less chance of a best picture win. Oscar's five best directing nominees are: Adam McKay for "Short;" George Miller for "Max;" Alejandro Gonzalez Inarritu for "Revenant;" Lenny Abrahamson for "Room;" and Tom McCarthy for "Spotlight. "All of them except for Abrahamson are also DGA nominees. Seven of the eight best picture nominees– "Room" is the exception -- are nominees in the Producer Guild of America's (PGA) best ensemble cast category, its equivalent of a best picture race. The PGA, whose awards ceremonies will be held Jan. 23, is considered a very strong bellwether for the Oscars. The Academy's producers branch has 483 members and is its second largest branch. Only two of the Academy's best picture nominees are also competing in the Screen Actors Guild's (SAG) best ensemble cast race, the guild's equivalent of a best picture competition. That gives "Short" and "Spotlight" the advantage of attracting votes from members of the Academy's actors branch. Actors are the largest of the Academy's branches, having 1,138 of the 6,261 voting members. SAG's awards ceremonies will take place Jan. 30. Academy members do their final voting from Feb. 12-23, so there's plenty of time for them to be influenced by the PGA and SAG awards. It also can help if best picture nominees have stars who received nods for best actor or actress. Because the media pays so much attention to stars, such noms help keep films on Academy voters' radar screens. Only four of the eight nominees will getthat kind ofhelp from their lead stars – "Brooklyn" (Saoirse Ronan), "Martian" (Matt Damon), "Revenant" (Leonardo DiCaprio) and "Room" (Brie Larson). Another measure of likely best picture success is the number of nominations each title receives sincethat shows how many Academy branches are supporting it. On that basis, here's how the nominees rank: "Revenant" (12), "Max" (10), "Martian" (7), "Bridge" and "Spotlight" (6 apiece), "Short" (5), "Room" (4) and "Brooklyn" (3). Looking at the number of noms as well as participation in the key directing and film editing races, only"Revenant"and "Max" are looking good. Each has double digit noms and both are competing in those two other key categories. "Short" and "Spotlight" are also up for directing and film editing, but have far fewer noms than "Revenant" and "Max." Typically, it's the films with the most noms that win best picture because all those votes from the various branches add up. Also worth taking a look at are the British Academy's BAFTA noms since many of its members alsobelong to our Academy and willalso be voting for Oscars. Only three of Oscar's best picture contenders are also BAFTA best picture nominees – "Short,""Revenant" and "Spotlight. "For what it's worth, two of those films have already prevailed in recent high profile best picture races. 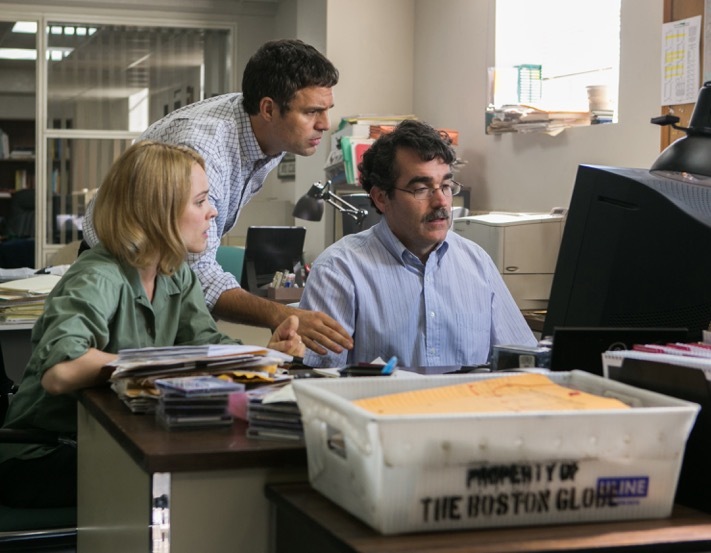 "Spotlight"took top honors Sunday night at the Broadcast Film Critics Association's Critics Choice Awards and"Revenant"was the Golden Globes'winner for best picture-drama. Boxoffice success is another factor that impacts on the best picture race. Films that are embraced by moviegoers tend to do resonate more with Academy members than titles that under-perform at the boxoffice or just haven't played wide enough to have been seen by the Oscar telecast's broad audience. It hurts ratings if the big television audience the Academy must deliver to advertisers isn't familiar with the movies, especially those competing for best picture. Films like"Revenant" and "Max" are strong action adventure stories that scored at the boxoffice. Both are mainstream studio releases – from 20th Century Fox and Warner Bros., respectively. That's a departure from the small specialty distribution titles that have dominated the Oscar best picture race in recent years. The best picture nominees ranked by their estimated domestic grosses through the four day Martin Luther King holiday weekend are: (1) "Martian" - $227.2 million; (2) "Max" - $153.6 million; (3) "Revenant" - $97.2 million;(4) "Bridge" - $70.8 million; (5) "Short" - $51.8 million; (6) "Spotlight" - $31.1million; (7) "Brooklyn" - $25.2 million; and "Room" - $6.2 million. With all of those considerations in mind, it's "Revenant" that emerges as the most likely best picture winner at this point. It's got 12 noms, the most for any nominee. It's in the directing and film editing races. And it's got DGA, PGA and BAFTA noms –although no SAG nom. "Revenant's" closest competition appears to be "Max," which has 10 noms and is nominated for directing and film editing. It has DGA and PGA noms, but no BAFTA or SAG nods. "Revenant" also benefits from being a current theatrical release while "Max" opened last May and finished its theatrical run in late September. Bottom line:Of course, where the Academy's concerned there always are exceptions and surprises, so anything can happen Feb. 28. It's way too soon to jump into a best picture betting pool, but keep an eye on "Revenant,"which looks particularly strong right now.